William Beatty (January 19, 1835 – December 2, 1898) was an Ontario businessman and political figure. He was born in Stonyford, Ireland in 1835 and came to Thorold in Upper Canada with his family the same year. He attendedVictoria College in Cobourg, receiving an LLB in 1864. He was elected to the university’s senate in the following year. He also worked with his father and brother in the timber trade. Their company operated a sawmill on the Seguin River at Parry Sound, primarily managed by William, and a steamship service between Collingwood, Parry Sound and Port Arthur/Fort William (Thunder Bay), mainly operated by his brother James Hughes. The firm set up a town at Parry Sound and William also served as a lay Methodist minister for the community. 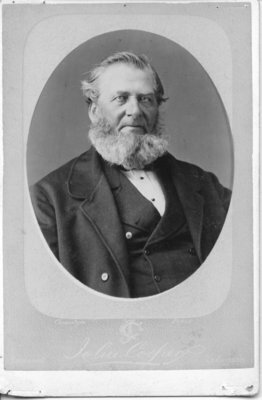 In 1867, he was unsuccessful in a bid to represent Algoma in the Canadian House of Commons, losing by 9 votes; he was elected to represent Welland provincially later that same year. He was not reelected in the next general election in 1871. Later that year, the operation in Parry Sound was sold and Beatty settled there. He bought out his brother and father’s share in the town site and set up a general store there. With Beatty’s support, a vote was taken to keep the township free of alcohol under the terms of the Dunkin Act. Up until 1950, anyone who bought land in the town had to sign an agreement not to sell alcohol on their premises. Over the years, Beatty operated a number of mills at Parry Sound. He also retained a share in the shipping operation. He operated a hotel located on the waterfront and helped establish a railway line to Parry Sound, which was later taken over by John Rudolphus Booth’s Ottawa, Arnprior & Parry Sound Railway. 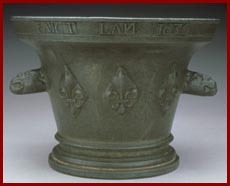 Found near Parry Sound, Ontario, in 1870, this mortar was probably carried from Sainte-Marie-among-the-Hurons by fleeing French or Huron refugees. Huronia was destroyed by the League of the Iroquois between 1648 and 1652. BEATTY, WILLIAM, businessman, Methodist lay minister, and politician was born on January 19, 1835 in Stonyford (Republic of Ireland), second son of William Beatty and Frances Hughes. He married on December 9, 1873 Isabella Eliza Bowes, daughter of John George Bowes, and they had four daughters and a son. He died on December 2, 1898 in Parry Sound, Ontario. In 1835 William Beatty emigrated from Ireland with his family. They settled in Thorold, Upper Canada, where William Sr erected a tannery and, several years later, two sawmills, on the Welland Canal. William Jr was educated at local schools before he attended Victoria College, Cobourg, where he received a B.A. (1860), M.A. (1863), and LLB (1864). In 1865 he was elected to the university’s senate, and sat on that body for the next quarter of a century. Despite his academic abilities, William had become involved with his brother James Hughes and their father in the lumber business. In the summer of 1863 they travelled up the north shore of Lake Huron in search of timber limits. On Parry Sound, at the mouth of the Seguin River, they came upon a sawmill and a 50-square-mile berth which had been forfeited to the crown by two brothers, William Milnor Gibson and James Alexander Gibson. The Beattys were immediately taken with the possibilities of the holding, and obtained a lease to the timber rights on 234 square miles surrounding the mill site. In 1867 another 50 square miles were acquired, on Moon River. Although all three Beattys were partners in J. and W. Beatty and Company, which was formed to exploit the timber limits, it was William Jr. who took the most interest in the operations and he served as manager. The Parry Sound Road, surveyed by John Stoughton Dennis and begun in 1863, was completed by William four years later, making the outpost accessible by land from the Muskoka Road to the south. While William managed the lumbering end of the business, James supervised the operation of the Waubuno, built for the Beattys at Port Robinson in 1865 by Melancthon Simpson. This 193-ton steamer transported passengers and supplies from the Northern Railway’s railhead at Collingwood to Parry Sound and Thunder Bay, becoming the primary commercial vessel on the upper Great Lakes. In May 1867 the Beatty firm purchased 2,198 acres of crown land at the mouth of the Seguin for a town site; in October 1869 the first official town plan was completed. William Jr. made the emerging community extremely attractive to potential settlers and as early as 1869 Parry Sound could boast the services of a doctor and a teacher. There was also a grist-mill, a public reading-room, a weekly newspaper (the Northern Advocate, founded by Thomas McMurray), and a stage-coach service to Bracebridge, operated by the Beattys. A devout Methodist, William had conducted services as a lay minister from as early as the fall of 1864. Two years later he donated land and materials for the village’s first church. During the summer months he held outdoor prayer-meetings in an attempt to convert the natives and he attracted worshippers from the entire Georgian Bay area. He quickly earned the nickname of Governor for his leadership and attention to the needs of the settlers. In 1867 Beatty contested the first federal general election for the riding of Algoma, which included Parry Sound. Unable to get a boat-load of supporters to Sault Ste Marie in time to vote, he lost by a mere nine votes. That year, however, he was elected as a Reformer to the Ontario legislature for Welland. The major achievement of the first session, in 1868, was the passage of the Free Grant and Homestead Bill. Beatty spoke in favour of the bill and suggested practical amendments – one, which was incorporated, stated that timber rights on free land should be granted only after a settler had fulfilled a stringent set of requirements and had been granted a patent. 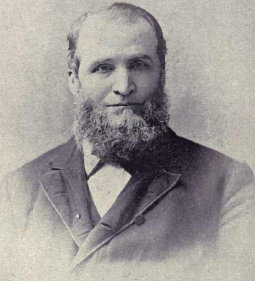 In March 1871 Beatty lost his seat, largely because he had supported the coalition government of John Sandfield Macdonald. Some time after Beatty’s defeat, the partnership of J. and W. Beatty and Company was dissolved. James was becoming increasingly involved in shipping; William Jr, who remained primarily interested in being a merchant and a lumberman, decided to settle permanently at Parry Sound. In December 1871 the three partners sold the sawmill and a portion of the property at the mouth of the Seguin to Hugo Burghardt Rathbun and Edward Wilkes Rathbun* of Trenton for $125,000. The Rathbuns immediately resold the properties to Anson Greene Phelps Dodge, John Classon Miller*, and others who formed the Parry Sound Lumber Company in 1872. In December of that year William acquired the shares of his father and brother in what remained of their original 2,198-acre grant for $30,000. Beatty, who had witnessed the ravages caused by alcohol in other lumbering centres, was determined that the settlement should become a respectable village. 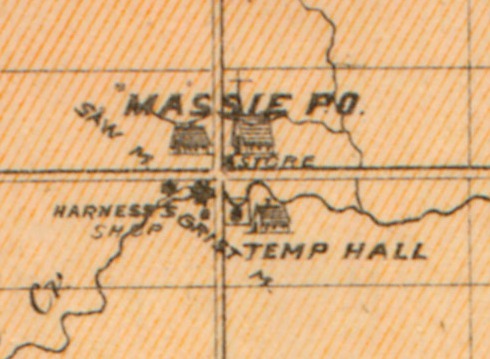 Many of the early settlers in this company town supported his temperance position. In the summer of 1872 the residents of McDougall Township, in which Parry Sound was located, voted to keep the township dry, under the provisions of the Dunkin Act [see Christopher Dunkin]. In addition, from the time that Beatty obtained sole ownership of the town site in December, anyone who bought town land had to sign an agreement prohibiting the sale, barter, or exchange of liquor on the premises. The force behind the document was that Beatty or his descendants could repossess the land of violators. Most of the settlers, however, shared his principles, and there is no documented instance of a deed being revoked. The so-called Beatty Covenant remained in effect in Parry Sound until 1950. Beatty’s primary occupation after the dissolution of the Beatty firm was the proprietorship of the general store established in Parry Sound in 1863. He did, however, continue to venture in and out of the lumbering industry and other enterprises. In 1874 he built the Seguin Steam Mills, which he operated until he sold them to the Parry Sound Lumber Company in 1881. Nine years later he obtained another sawmill, running it until its destruction by fire in 1893. Beatty retained his interest in the Waubuno, which the family had continued to operate after 1871. It served as the lifeline of the north shore until the introduction in 1876 of the Northern Belle by Thomas and John Joseph Long of Collingwood. The competition between the vessels soon led to a merger under the name of the Georgian Bay Transportation Company Limited, and Beatty obtained a share in the new venture. 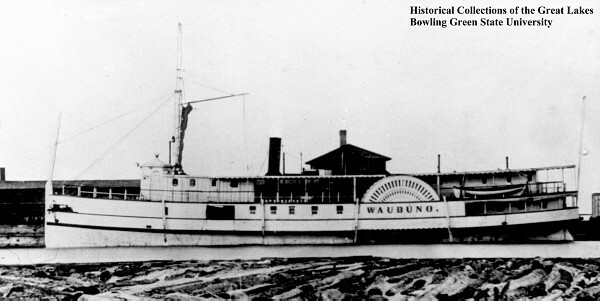 The tragic sinking of the Waubunoin a storm in November 1879 resulted in the Georgian Bay Transportation Company being at the centre of several lawsuits for negligence. Although it was finally exonerated, disasters continued to plague the company. In May 1882 the Manitoulin, built to replace the Waubuno, was destroyed by fire and in September the Asia sank with the loss of more than 100 lives. In 1885 the directors sought a surrender of the provincial charter and the remaining ships were absorbed by the federally incorporated Great Northern Transit Company Limited (the White Line), of which James H. Beatty was the primary stockholder. One of the first to recognize the tourist potential of the Parry Sound area, in 1881 William Beatty had incorporated the Parry Sound Hotel Company Limited, with himself as president. The company constructed the imposing Belvidere Hotel, which overlooked Georgian Bay and catered to summer visitors until its destruction by fire in 1961. Beatty was also one of the organizers of the Parry Sound Colonization Railway, incorporated in 1885 to construct a line from the Northern and Pacific Junction Railway to Parry Sound. He served as vice-president of this venture until it was taken over by John Rudolphus Booth, the Ottawa lumber baron, and his Canada Atlantic Railway in 1893. William Beatty died in Parry Sound in 1898 after a lingering illness. The Parry Sound North Star best captured the sense of grief felt by local residents: “Truly he earned the endearing title of ‘Governor’ which was universally accorded him. . . . His reputation extended far beyond the borders of the town and district where his life’s work has been spent.” Beatty left his home, Minnewawa Grove, to his wife and a sizeable bequest to St James’ Methodist Church in Parry Sound. The rest of his estate was divided between his five children and his will stipulated that his heirs could carry on his business or wind it up. In 1904 the William Beatty Company Limited was incorporated, with members of the immediate family as directors, to provide for the management of his general store and coal business. Ten years later a second company, William Beatty Lands and Timber Limited, was incorporated to handle the sale of the property and timber left by Beatty. Both are still active corporations. Henry Edgar St. George, a talented painter, artist in stained glass and a gifted cornet player who lived in London, Ontario between 1892/3 and 1908. Born in Alexandria, Egypt in 1860 to a British noble family, he was later educated at Cambridge University and then in Paris, France where he studied painting and the art of stained glass. He immigrated to Newfoundland in 1880 and a few years later began a career with Hobbs Manufacturing and Glass Company in Montreal, Quebec as their head artist. After moving to London, Ontario in 1892/3 with his wife and family, he worked with the London office of Hobbs Manufacturing while developing his own business, Western Glass Decorative Works. Examples of his stained glass can be found in London in the church office at Metropolitan United Church (a memorial window for his young son, Clarence) and throughout St. Mary’s Roman Catholic Church which was completed in 1902. 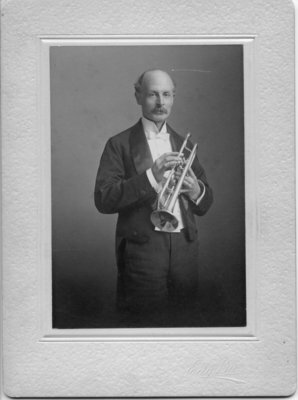 Another talent illustrated by this portrait, was Mr. St. George’s skill at playing the cornet. During his stay in London he gained a reputation as a musician with the London Band and also at the then First Methodist Church (Metropolitan United Church) where he was a member. He also performed concerts with his daughter, Edith St. George. As his own business flourished he chose to move his family to Windsor in 1909, with an eye to opening an office in Detroit, Michigan. Mr. St. George specialized in Church art and with his knowledge of the Hebrew, French, Latin and Arabic languages, his stained glass is reputed to be in churches of various faiths throughout Canada and parts of the United States. During World War I demand for stained glass diminished and looking for better opportunity, he moved to Toronto in 1918. Sadly, he died six weeks later, at the age of 57, after being struck down by a truck as he cycled home at the end of the day. Dr. John Salter, born in London England in 1802, was a druggist who opened an apothecary shop first on Ridout Street opposite the courthouse. His drug store was later located on Dundas Street near Clarence Street. 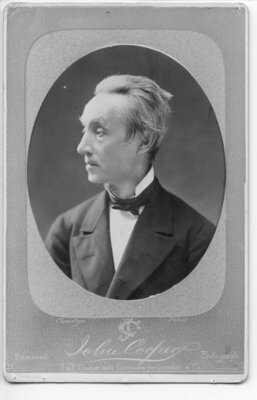 Dr. Salter died at the age of 79 in 1881. A formal black and white portrait of John Holden, an early pioneer stonemason in London, Ontario taken by the photography studio of John Cooper. Mr. Holden is dressed in a dark suit with a waistcoat and white shirt. The tie at his neck is barely visible through his luxuriant graying beard. John Holden died September 15th, 1896 at the age of 84 years. The London City Directory for that year listed his address as 242 Talbot Street. The location given on the map is a guess as to where that address near to the old Labatt’s Brewery would have been.